Ninja Kiwi’s popular Bloons series gets another spinoff with Bloons Super Monkey 2 releasing this week on iOS and Android. This shoot ’em up has you playing as a flying monkey, trying to take down all those wicked bloons, collecting red and blue blops as you defeat them, and powering yourself up so that you can take down more bloons as you go along. If you haven’t played a Bloons game before, either the previous Bloons Super Monkey ($0.99) or Bloons TD 5 ($2.99), what you need to expect is intense action. 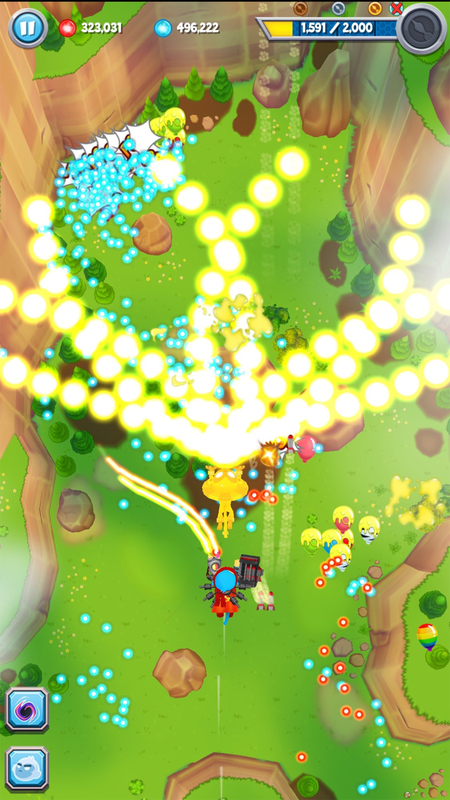 NinjaKiwi isn’t afraid to fill the screen with tons of bloons. Like, level 2 has just massive amounts of them on screen at once. Good luck! This isn’t just a mobile release of the web game of the same name, Bloons Super Monkey 2 has been refined, and given some new visual effects in a 3D world for the mobile release. There’s 50 levels in total, with over 40 powerups, over 90 weapons, and levels that will challenge you to kill every single bloon, which will be really, really difficult. Bloons Super Monkey 2 releases this week in early November, and will run you $2.99. Update: Game’s out now on Android!